- Indy MLB Pat Angerer (5 solo tackles-0 assists) had a quiet day by his standards. FS Antoine Bethea (8-1, forced fumble) had one of his better tackling days. DE Robert Mathis (3-0, fumble recovery, FF, 2 sacks) has recovered after a mid-season disappearing act. DE Dwight Freeney (1-0) made the Pro Bowl, which is one example why Pro Bowl status does not always equal fantasy stud status. - Houston ILB Brian Cushing (7-5, 2 FF, 1 sack) has had two straight monster games. OLB Connor Barwin (2-1, 1 sack) keeps racking up sacks, while rookie OLB Brooks Reed (3-0, fumble recovery, pass defensed) hasn’t downed a QB since week 12. Rookie DE J.J. Watt (5-0, 1 sack, 3 PD) had another big game. - Buffalo FS Jairus Byrd (5-2, PD, 37-yd int return TD) took one to the house. ILB Nick Barnett (3-3) wasn’t spectacular. OLB Chris Kelsay (6-3, 2 sacks, PD) has come alive. SS George Wilson (3-1) has not been the same since missing time to a neck injury. - Denver WLB D.J. Williams (4-1) has cooled a bit after a tackling hot streak. Rookie SLB Von Miller (0-1) has been fantasy’s invisible man the last two weeks. DE Elvis Dumervil (3-0, 1 sack) has 9.5 sacks in the last eight games. - New England WLB Jerod Mayo (4-9, 2 sacks) has been tackling well the last few games. SLB Rob Ninkovich (3-3, FF, 1 sack) has been racking up sacks. - Miami ILB Karlos Dansby (9-4) resurrected his season after a slow start. Just when I was ready to brand SS Yeremiah Bell (8-4, 1 sack) a disappointment, he reminds us why he was a preseason top-tier safety. - NYG DE Justin Tuck (4-0, 1 sack, 2 PD) has actually been putting up Justin Tuck numbers recently. 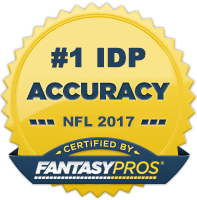 The fans who left DE Jason Pierre-Paul (4-1, 2 sacks) off their Pro Bowl ballot apparently don’t play IDP fantasy football. - NYJ ILB David Harris (2-2, int, 1 sack, PD) deserves a nod. Rookie DE Muhammad Wilkerson (3-2, 1 sack) has made some noise the last couple of games. - Cincy FS Reggie Nelson (5-2, int, 1 sack, PD) is capable of a big game. WLB Thomas Howard (3-3, PD) cooled off after a hot streak. DT Jonathan Fanene (2-0, 2 sacks) got to the QB. - Arizona ILB Daryl Washington (9-2) got a bunch of tackles. DE Calais Campbell (4-3, FF, 1 sack, 2 PD) has had a great season. - Tennessee rookie MLB Colin McCarthy (5-1) hasn’t been quite as awesome the last few games as he was when he first took over the starting gig. Where’s this been from DE Derrick Morgan (7-0, PD)? - Jacksonville MLB Paul Posluszny (4-1, PD) had another mediocre fantasy day. SS Dawan Landry (5-2, fumble recovery) appears to be back on track. - Pittsburgh ILB Lawrence Timmons (8-3, 1 sack) had his best game since his week 1 whopper. OLB Jason Worilds (0-3) disappointed anyone who had jumped on his bandwagon. - St. Louis MLB James Laurinaitis (7-6) got his usual bunch of tackles. DE Chris Long (1-1) failed to get to the QB. - Oakland MLB Rolando McClain (7-1, PD) continued his hot streak. FS Matt Giordano (9-1, int, PD) has been a capable fill-in for the injured Michael Huff. - Once Kansas City came out of its week 6 bye, ILB Derrick Johnson (6-1, int, 2 PD) put the fantasy pedal to the floor and has not let up. OLB Tamba Hali (6-0) has played pretty darn well, too. - Minnesota SLB Chad Greenway (4-12, PD) deserves a spot in this column if for nothing else other than to marvel at the number of assists he amassed. DE Jared Allen (1-3, 1 sack) got another sack. MLB E.J. Henderson (11-4) has shown flashes of brilliance lately. - ILB London Fletcher (7-10, .5 sack) has been off the charts since Washington’s week 5 bye. ILB Perry Riley (3-2, 1 sack, PD) continues to pick up Fletcher’s scraps. - Carolina WLB Jordan Senn (8-2) has made his presence known. SLB James Anderson (7-0, fumble recovery, PD) has had a good season. - Tampa Bay DE Michael Bennett (1-0, 1 sack) has played well since returning from injury. - Baltimore ILB Ray Lewis (9-1) has been outstanding since returning from injury. DE/OLB Terrell Suggs (3-1) wasn’t anything to get too excited about. - Cleveland MLB D’Qwell Jackson (4-3) had one of his worst games of the season. DT Ahtyba Rubin (5-2, 1 sack) is capable of a big fantasy day. - Detroit SLB Justin Durant (8-3, 1 sack) had a big day. MLB Stephen Tulloch (6-1) has been up and down. - San Diego SS Steve Gregory (7-1) has scored well lately. ILB Donald Butler (2-1, 1 sack) has seen his tackle numbers tail off. - Who needs Patrick Willis when you have San Fran ILBs like Navorro Bowman (7-5, 1 sack) and Larry Grant (6-6, FF)? Rookie OLB Aldon Smith (3-1, 1 sack) continues his outstanding season. - That’s more like it for Seattle SS Kam Chancellor (10-0). DE Chris Clemons (4-2, PD) has scored well lately. - Philly DE Trent Cole (6-0, 1 sack) has been putting up nice tackle numbers lately. DE Jason Babin (0-0) was surprisingly quiet. SS Kurt Coleman (1-0) suffered a season-ending bicep injury. - Dallas ILB Sean Lee (4-1) hurt his hamstring. OLB Demarcus Ware (4-0, 2 sacks) added more to his sack total. - Green Bay ILB Desmond Bishop (9-3) made a triumphant return from injury. OLB Clay Matthews (5-1, FF, int, PD) filled up the box score. - Chicago MLB Brian Urlacher (3-0) and WLB Lance Briggs (3-0) were quiet. CB Charles Tillman (4-1, 1 sack) got back on track. - Not much to get excited about for New Orleans’ IDPs: SS Roman Harper (3-2), DE Will Smith (1-2), and MLB Jonathan Vilma (4-3). - Atlanta MLB Curtis Lofton (3-6) has had a good season, but his solo tackles weren’t high enough for me in a lot of games. WLB Sean Weatherspoon (1-1) has the potential to disappear in games. DE John Abraham (0-1) came back down to Earth after 3.5 sacks in week 15.